Baby Alive Super Snacks Snackin' Lily! Check It Out!! Baby Alive Super Snacks Snackin’ Lily! Check It Out!! BABY DOLL THAT EATS: Feed this adorable Baby Alive Super Snacks doll with her special spoon (included) and she eats her food! PREPARE HER FOOD: Includes snack shaper and two cans of reusable Baby Alive doll food so kids can make baby's favorite pretend snacks. Don't spill on her special outfit! BABY DOLL POOPS AND EATS: Put baby's diaper on and she "poops" after she eats. Kids can have fun removing baby's diaper and caring for her like a real mommy or daddy would! 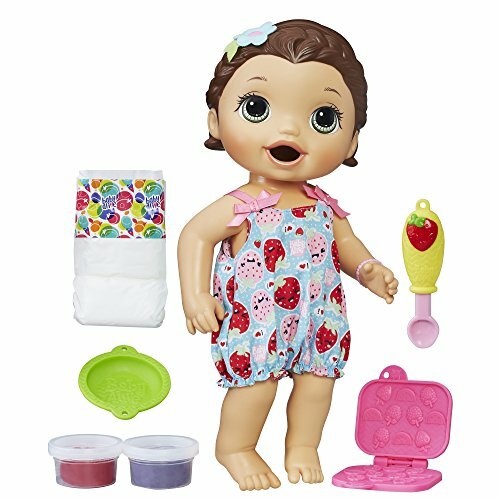 INCLUDES DOLL ACCESSORIES: Doll comes with everything little ones need to take care of their special baby, including outfit, spoon, snack shaper, bowl, 2 cans of reusable Baby Alive doll food, one diaper, and instructions. GREAT FOR KIDS AGE 3+: Little mommies and daddies can have fun feeding their baby. She's the perfect doll for girls and boys 3 years old and up.